Cancer or cancer treatment may cause fatigue. This can feel like physical, emotional, and mental exhaustion that goes on for a long time. This type of fatigue is not the same as feeling tired after not getting enough rest. Most people receiving cancer treatment have fatigue. Some may have it for months or years after finishing treatment. Managing symptoms, which can include fatigue, is an important part of cancer care and treatment. This is called palliative care or supportive care. Talk with your health care team about any symptoms you or the person you are caring for experience. ASCO advises doctors to screen for and treat fatigue when cancer is first diagnosed. It is an important part of cancer care. In addition, your doctor will ask about your level of fatigue throughout treatment and recovery. When do you feel most tired? Health changes related to cancer. Your doctor may take a blood sample or perform other tests. The results may show cancer-related causes of fatigue. Other health conditions. Health conditions other than cancer may cause or worsen fatigue. Your doctor may ask questions or recommend tests to find them. Pain. Living with constant pain is often exhausting. What’s more, many pain medicines cause drowsiness and fatigue. Ask your health care team about other ways to manage pain. And ask about the common side effects of these options. Depression, anxiety, and stress. These conditions can increase exhaustion. Managing stress and treating depression and anxiety often reduces fatigue. Insomnia. Stress, pain, and worry may contribute to insomnia, which means having trouble falling asleep or staying asleep. In addition, some medicines disturb normal sleep patterns. Poor nutrition. A well-balanced diet may help reduce fatigue. Consider talking with a nutrition counselor or registered dietitian (RD). These professionals can help you find ways to eat well, especially when you have taste changes or nausea and vomiting. Anemia. Many people with cancer have anemia, which is when your red blood cell count is low. People with anemia may feel extreme and overwhelming fatigue. Anemia treatment may include nutritional supplements, drugs, or blood transfusions. Physical activity. Staying or becoming active can help relieve cancer-related fatigue. Ask your health care team which types of physical activity are best for you. And ask what level of physical activity could help you. The type and level of physical activity may change during and after cancer treatment. Some people may benefit from working with a physical therapist. This is especially true if they have a higher risk of injury. This may be due to cancer, cancer treatment, or other health conditions. Physical therapists help people increase or maintain physical functions. In addition, the following methods may be helpful. But researchers have not yet fully studied the results of these strategies. If you are interested, talk with your health care team. Ask for referrals to professionals who specialize in using these methods for cancer survivors. In addition, researchers are studying whether supplements, such as ginseng and vitamin D, may help. Talk with your health care team about these options. 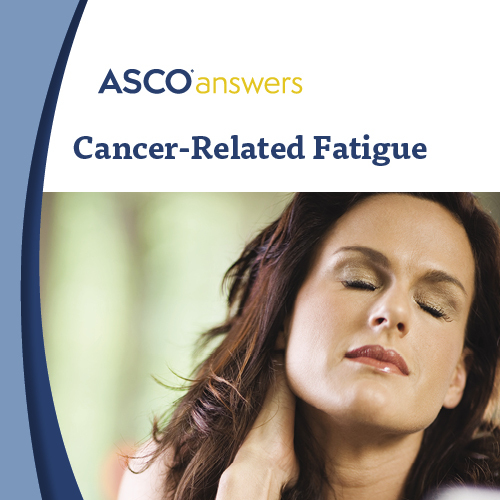 Download ASCO's free Cancer-Related Fatigue fact sheet. This 1-page printable PDF includes an overview of the possible causes of fatigue, treatment options, words to know, and questions to the health care team. Order printed copies of this fact sheet from the ASCO University Bookstore.